We have added another gig to this weekend’s fun. Yep, three shows in two days! 2. We play Saturday afternoon, October 17 in downtown San Rafael at the Music in the Plaza, San Rafael. The stage is in the Courtyard Plaza off fourth Street. Our set starts at 4:45PM. It’s FREE and all ages! What’s not to like? Tickets: $5 cover OR buy a calendar and get in FREE. All Ages. 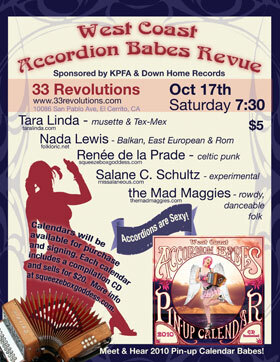 This Accordion Babes Revue is sponsored by KPFA and DownHome Music. 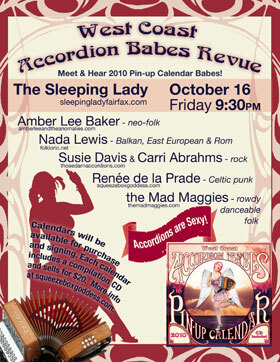 We will be joining Nada Lewis (Eastern European/Rom), Salane C. Schultz (experimental), Renée de La Prade (Celtic punk), and Tara Linda (musette & Tex-Mex). 33 Revolutions Records/Cafe, the East Bay’s coolest record store/cafe has draft beers & wine, and will have a special deeply discounted ($1-2) accordion vinyl selection for this show!